I have a bit of a love-hate relationship with Daniel Boulud. Love because his creations are amazing – hate because the recipes he publishes for the “peeps” are sometimes not so friendly or “tight” – like the trifle he published in Elle Décor that called for a pan much too small for the cake batter and led to a rather unpleasant explosion in my oven. Or the fact that he sometimes chooses baking dishes that are entirely uncommon and require a trip to a specialty baking store (like the soufflé recipe I am hoping to attempt today). This one, however, is a keeper. 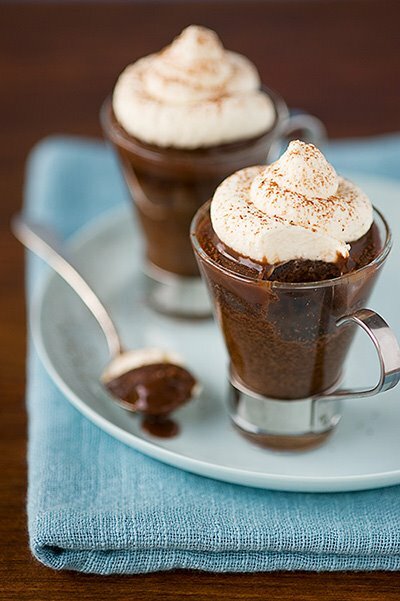 It’s a recipe for chocolate coffee cupcakes that has been making its way around the blogsphere and that is simply divine. Yes, it requires a few more steps than one would like but they are all worth it! The cupcakes are served with a mocha ganache and a mascarpone cream that will make you swear off buttercream forever! The fun part about this recipe is finding fun alternatives to cupcake wrappers. I’ve used paper coffee cups, colored ramekins and see-through espresso cups. The recipe makes 30 cupcakes so you can try styling them a few different ways. Preheat the oven to 350 degrees F. Line 30 standard muffin cups with paper liners. Combine the milk, cocoa, coffee and 1/4 cup water in a small saucepan and bring to a boil, constantly whisking, until the cocoa and coffee have dissolved. Let cool and pour into a liquid measure. Sift together the flour, baking soda, and salt. In the bowl of a mixer, cream the butter, sugar, and vanilla on medium speed until light and fluffy. Add the eggs, one at a time, mixing well after each addition. With the mixer on low speed, add the dry ingredients alternately with the milk mixture in three batches, ending with the liquid. Fill each muffin cup halfway with the batter. Bake 18 to 20 minutes until a toothpick inserted into the center comes out clean. Remove the cupcakes from the pan and let cool completely on a wire rack. Combine 1 cup of the heavy cream and coffee beans in a small saucepan and bring to a boil over high heat. Remove from the heat, cover, and let infuse for 10 minutes. Strain through a fine-mesh sieve into a clean sauce-pan and bring back to a boil. Put the chocolate in a medium bowl and pour the hot cream over it, stirring slowly, until the ganache is smooth. 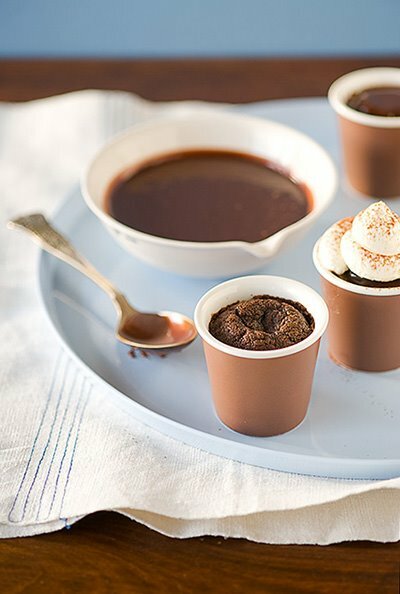 Spoon enough ganache over each cupcake to fill the liners to the rim. Using a whisk or in the bowl of a mixer fitted with a whisk attachment, whip the remaining 2 cups of heavy cream to stiff peaks. Add the mascarpone and confectioners sugar and whisk until smooth. Spoon the mascarpone cream into a pastry bag fitted with a medium round tip and pipe the cream on top of the ganache in a circle. Leemei Tan from My Cooking Hut invited me to do a "guest post" about food and photography with a winter recipe. She has posted both today - hop over and see. What fun to be invited to participate in someone else's blog! 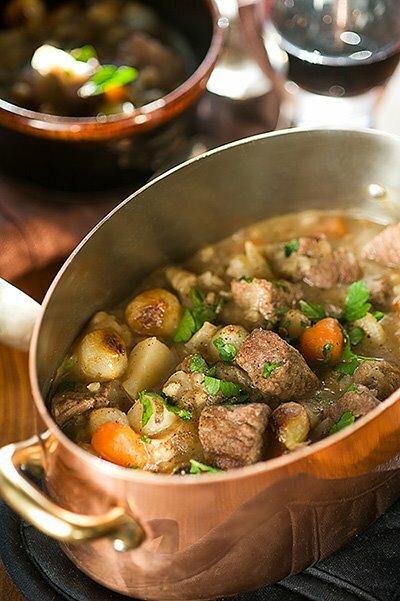 For the post, I developed a recipe for a hearty beef and barley stew. It took several tries to get it the way I wanted it but all of the rejects were delicious so no complaining here! I'm posting the recipe below. See Leemei's blog for the rest of the story. Season beef generously with salt and pepper on all sides. Heat 1-2 tablespoons oil in a large skillet and brown beef on all sides. Transfer beef to a 5-6 quart Dutch oven or other heavy-bottomed sauce pan. Add water, thyme sprigs, 1-2 sprigs Italian flat leaf parsley, Worcestershire sauce, vinegar, half of the yellow onion (skin on is fine) and a whole carrot (skin on is fine). Bring to a boil and then reduce heat and simmer, partially covered, for 30-40 minutes. Remove thyme, onion and carrot. Meanwhile, cut potatoes and Jerusalem artichokes or parsnips into 3/4 inch cubes and peel and chop remaining carrots into 1 each pieces. Re-heat pan used to brown the beef (add a little additional oil if necessary) and cook cut vegetables plus whole pearl onions for several minutes until they begin to brown. Take care not to crowd the pan. If your pan is not big enough, brown in batches. After beef mixture has cooked 30 minutes per the above, add the barley and browned vegetables plus a generous sprinkling of kosher salt and pepper. Bring temperature back up to a boil, and then reduce to a simmer. Simmer, partially covered for an additional 30-40 minutes. At this point,the sauce will have thickened and the beef will be fork-tender. If sauce is not thick enough for your liking, remove cover, raise temperature and cook a little longer. If too thick, add cold water in ¼ cup increments until consistency is as desired. Adjust seasonings to taste. Serve with a sprinkling of chopped flat leaf parsley. Here’s a break from hearty winter fare, if only for a post. 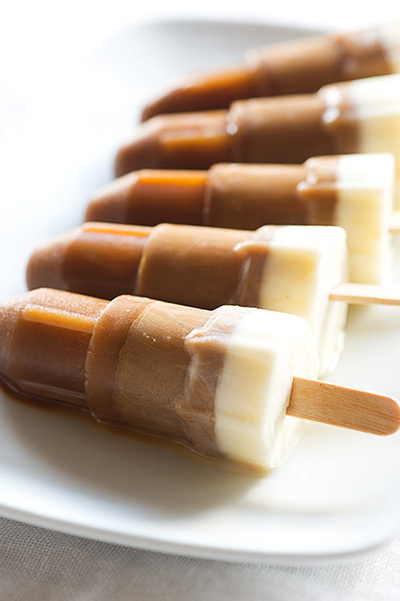 I have an absolutely out-of-season recipe to share (well, that is if you are in the Northern hemisphere): Vietnamese iced coffee popsicles. Have you had Vietnamese iced coffee? I love the strong but sweet flavor and the thickness of it. It’s dessert in a drink – and even more dessert-like in a pop. I love the way the different layers of color look as the coffee blends with sweetened condensed milk. I worked to replicate this in the pop and am happy with the way it turned out (it took a bunch of attempts, believe it or not!). The pops pack a refreshing punch after dinner, or would be perfect served as a pick-me-up at the pool. Try them and see! Place ~3 tablespoons coffee in between filter layers. Screw top down until firmly in place. Set over a heat-proof glass. Pour boiling water into filter in batches so that you end up with approximately 2 cups coffee. If coffee weakens significantly as you go along, remove grinds and replace with fresh ones. Add sweetened condensed milk to coffee by the teaspoonful until coffee lightens a bit and is sweet enough to your taste (take care to add enough condensed milk so that the end result is more creamy than icy). This will be the first layer. You will add more condensed milk to create a sweeter and lighter layer next. Pour enough coffee into each pop to fill the pop ~1/3 full. Place popsicle sticks in pops and freeze for a couple of hours until firm. Meanwhile, cover and refrigerated remaining coffee and condensed milk. Add a few more teaspoonfuls of condensed milk to coffee until coffee reaches a noticeably lighter shade. Fill pops to ¾ or a little less full, as desired. Freeze again until solid. Mix several tablespoons condensed milk into whole milk until milk is thick and sweet. Top popsicles off with the mixture, leaving an inch or so of popsicle stick sticking out from the top, and freeze one last time. Unmold pops by running under warm water for a minute or two. Enjoy before they melt! I hope you all enjoyed a fun New Year’s Eve and relaxing New Year’s Day. Ours was pretty low key. We had dinner at home and then popped into a friend’s party later on. We were back well before midnight. Today we ran errands and did a lot of long overdue organizing. Not too exciting, but satisfying to get done. The weather here has turned particularly cold and blustery. It’s the time of year that’s best suited to nesting at home, keeping warm, and eating comfort foods. I’m turning to some of my winter favorites – beans and cabbage. I’ve written about Rancho Gordo heirloom beans before. They have become a cult favorite among those who love beans and who love artisanal products and not without good reason: they are unusual, full of flavor and cook well. I’ve often found that typical store-bought have been sitting on the shelf so long they take a long time to cook and shrivel up when re-hydrated. These are produced in small quantities and turn over quickly, thereby having none of those problems. A terrific hearty soup using one of their varieties appeared in Metropolitan Home in November. As soon as I read it, I knew I had to make it. Conveniently I had all of the shelf-stable ingredients on hand and only had to supplement them with the few additional fresh ingredients. 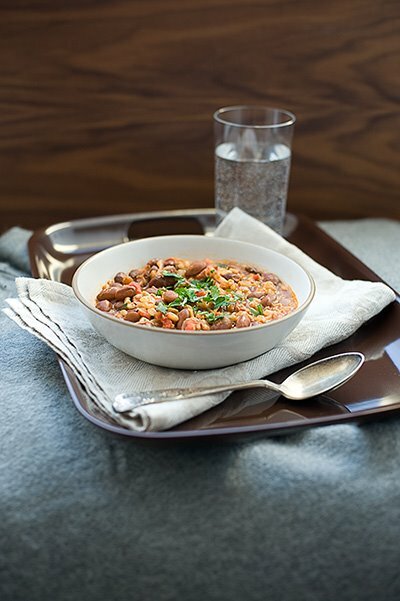 Farro is a new favorite of mine and I was excited to try it in a soup. The soup is thick, hearty and filling and sings of all of the good things about winter. p.s. Rancho Gordo has a new cookbook out. I have not had a chance to take a look yet. Soak beans overnight in water to cover generously.the next day,drain the beans and put them in an 8-qt pot with 3 quarts cold water. Bring to a boil over moderate heat, skimming any foam. Cover partially and adjust the heat to maintain a gentle simmer. Cook until the beans are beginning to soften, about 45 minutes. Stir in the farro and the cabbage. Return the soup to a simmer, partly covered, 30-45 minutes more. While the beans and farro cook, heat the olive oil and pancetta in a skillet over moderate heat. Let the pancetta sizzle and render some of its fat, but do not let it brown. Stir in the onion, garlic, rosemary, parsley and hot pepper flakes. Cook, stirring until the onion is soft, about 10 minutes. Stir in the tomatoes, raise the heat to moderately high, and cook, stirring constantly, until the sauce is thick and the tomatoes have softened, about 5 minutes. Stir the contents of the skillet into the soup pot and simmer, partially covered, for 15 minutes. Season with salt. Garnish with more minced Italian parsley before serving.